Escape from Thanksgiving Day info about the game-Games2Rule. Escape from Thanksgiving Day is another type of point and click new escape game developed by games2rule.com. 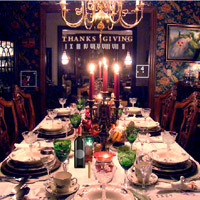 In this Thanksgiving Day you are arranged a party at your house. You are invited all your friends for celebrating Thanksgiving Day. You did all type of arrangements for the party. You also cooked very testy foods and fully decorated your house for the party. Now you have to go outside to call your friends for party but unfortunately your door is not opening it is locked from outside. What you will do now? Your friends are waiting for your call and you have to go outside to call them but you are trapped. Do something to escape from there. Find some clues, object and solve some puzzle for escape from house. Just start searching objects and escape from there for calling your friends. Good Luck Have Fun!